I signed the waiver detailing the inherent risks in travel and read the recommended reasons for travel insurance. One was to get my body home in the case of my death. I feared leaving my children, “what if something happens to them while I am gone?” I thought, “what if something happens to me and they have to endure the loss?” It was unbearable to consider. But suddenly I had arrived in Italy and Scott was with me and everything was as we had remembered on our honeymoon. I was happy and at peace. It was warm, the sun was shining and we were walking hand in hand down a cobblestone street in Montalcino, smiling at one another and taking it all in. The road was wide with tall stone houses all in a row to our left and the low town wall beside it with a view of the bright green Tuscan landscape rolling beyond. Even the furniture in our room was familiar, pieces had come from our home. I felt welcome and secure. Then Scott was gone and I was walking by myself again along the road looking out over the bright green hills touching azure blue sky, signature cypress trees, and a few terra cotta colored villas when two parachuters came gliding slowly down from high above. It was a breathtaking sight, I felt the allure of their adventure. Except one was having trouble. The red parachute was billowing all around his body, sucked to him with only small pillows of trapped air inside. His arms and legs were flapping frantically to push it away and up so that it could gather air again. My heart was pounding as he started falling faster. I started running toward him. Someone must help him! I must do something! Running closer I knew I was helpless. I was too far away. Immediately I prayed, big, strong, you-better-hear-me-God prayers and I ran to the edge of the green, then gasped for air, and jolted awake. Body sweating, heart still racing, I was trembling as I looked at the clock, 4 a.m. I started to cry, the dream like a postcard image burning bright colors in my mind. It was too real, too symbolic. Was it process of prophesy? Over the next few days I couldn’t shake the fear I felt in that moment and wondered if I was going to be able to do this, if was I making a big mistake. Our family has already been devastated by grief, could I knowingly make a choice that involves some level of risk? Oh Dear God, these inevitable losses will happen someday, I know full well, but please not now, nor anytime too soon, I just don’t think I could bear it quite yet. 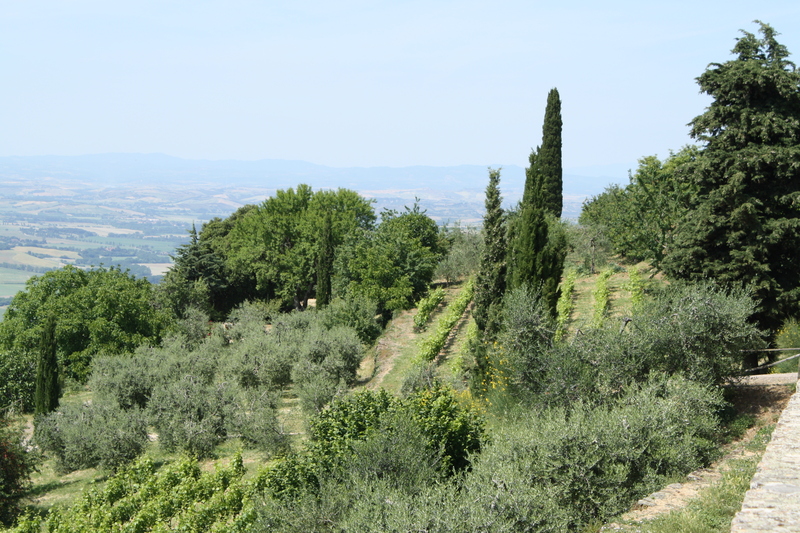 This entry was posted on Wednesday, June 1st, 2011 at 7:03 am	and tagged with death, Faith, fear, grief, Life as mom, Longing, loss, Meaning, Montalcino and posted in Italy. You can follow any responses to this entry through the RSS 2.0 feed. I am inspired my friend. I can’t wait to hear what God unveils during your travels. I miss you! Thank you Allie. I have tracked down my Italy writing and look forward to having time to edit and publish soon! Miss you too!